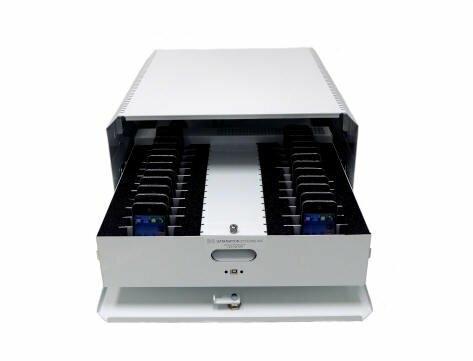 Compact and durable steel enclosure houses state-of-the-art universal 16-port and 8-port USB boards (CE, ETL listed). 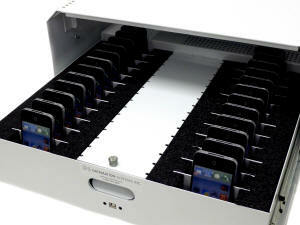 Ideal Sync and Charge Station for multiple iPhones and iPods used in healthcare and hospitality organizations. Can be used to charge and sync any iPod™, iPod Touch and iPhone™, as well as virtually any smart phone that charges with USB. Features unique future-proof updatable firmware. 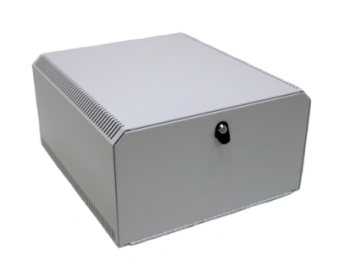 Power supply: 275W, 5V, 88~264VAC, constant current limiting circuit, overload/overvoltage/short circuit protection, all applicable safety approvals. Power supply is dual voltage 115/230 VAC. Power supply plugs into wall outlet with cord (provided). If you have a specific application or device you would like to secure, sync or charge, feel free to contact us. We offer solutions for just about any USB mobile device, battery or associated peripheral.